Open a support ticket on our site if you have an existing license. 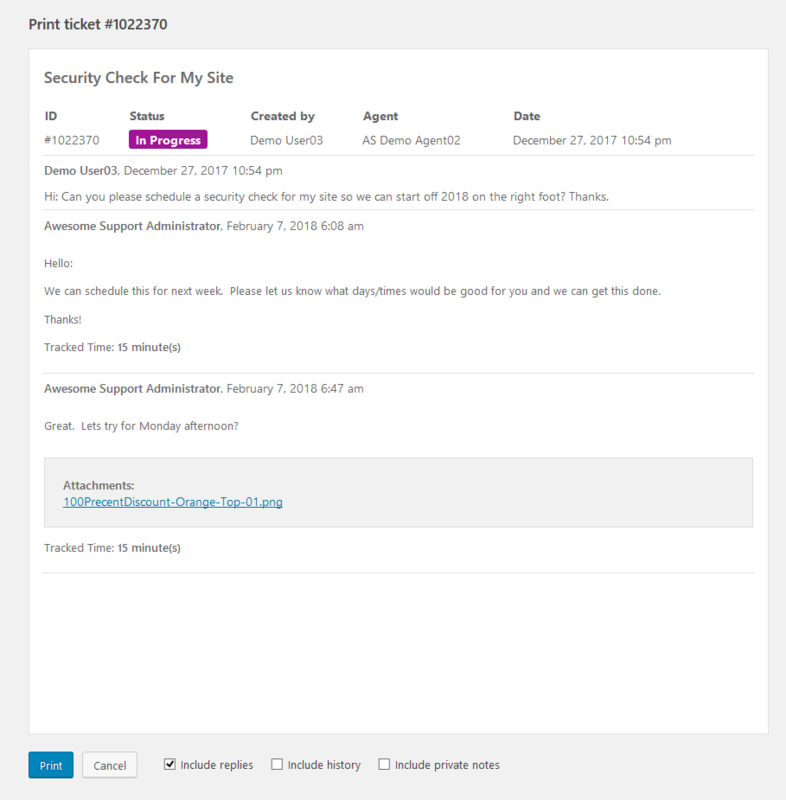 Open a ticket on WordPress.org if you do not have a license. Now, on to all the new features! Clicking the print button will then bring up a standard browser print dialog box through which you can print the ticket. 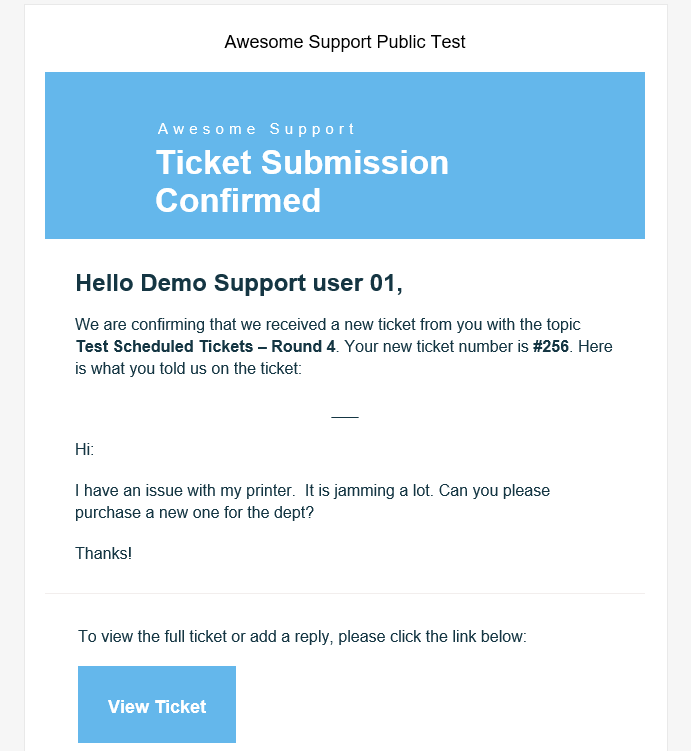 We also included the ability to print multiple tickets in a batch. You can select one or more tickets from the ticket list and then choose PRINT from the bulk ACTIONS tab. In prior versions of Awesome Support the email template tags agent_name and client_name always used the WordPress display name. In Awesome Support 5.2 you will have the option to use individual tags for the first name and last name. You will also have separate options for author_name and related author information. (Author information will come in handy when we introduce email options for private notes in the future). With the new Moderated Registration type you can keep your registrations open but choose to approve each user manually before they are allowed to open tickets. When this registration type is chosen, the user will receive a notice that their registration is pending approval and the admin will receive a notice about the new registration request. 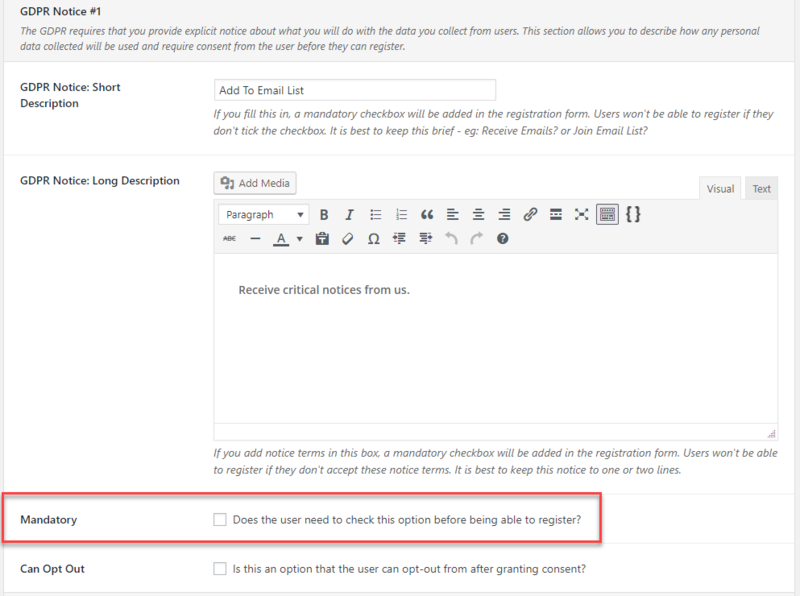 New email templates are provided that will automatically inform the user when the request is approved or denied. 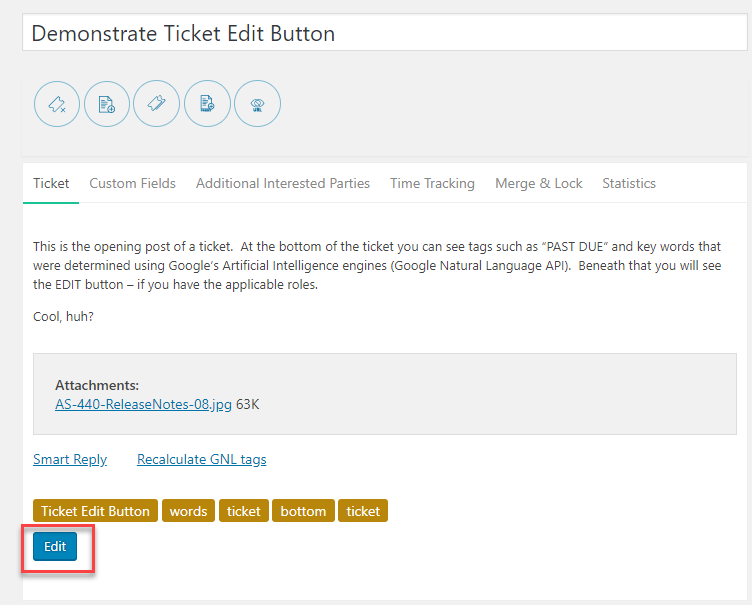 Prior versions of Awesome Support would only allow searches of the opening post and the ticket title. Now, we've provided the ability to search replies and, if installed, private notes as well. You will need an update to the Private Notes add-on in order to see the new option to search private notes. In version 5.0 we provided the option to add additional check-boxes and descriptions on the user registration screen. 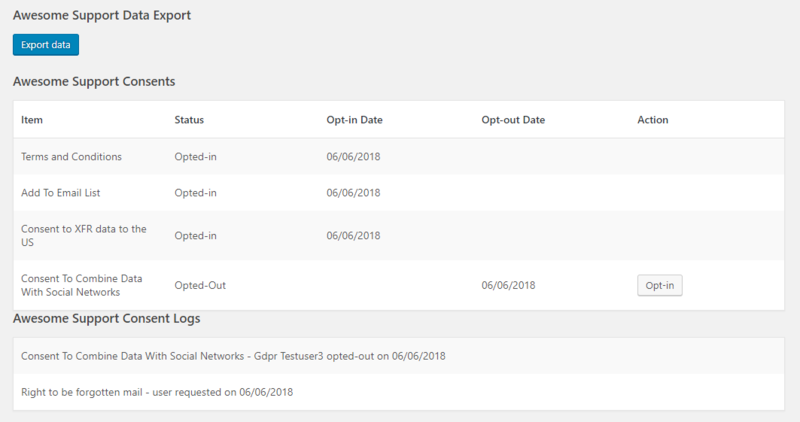 In this version we add a new option for those check-boxes to allow you to decide whether the option shown to the user is mandatory or optional - i.e. : if they need to affirmatively check one or more options before being allowed to register. Additionally, we provided an option that allows the admin to decide if the user can opt-out of their selection after granting consent. When a user registers using the Awesome Support registration form, any consents configured are added to the user profile. Changes to consents are also logged there. For developers, new filters and action hooks were added so that other plugins can easily integrate into the consent log and react to changes that are occurring. For example, a developer might choose to automatically unsubscribe a user from an email list if the user withdraws their consent for marketing operations. On the front-end, users will have options to remove consent or opt-in after registration. This will be located under a new PRIVACY button (described further below). And admins can do the same as well for a user by accessing a button directly inside the user profile - just look for the EXPORT DATA button under the AWESOME SUPPORT DATA EXPORT header in the user profile. WordPress 4.9.6 introduced the idea of Personal Data Erasers and Exporters through which plugins can integrate, offering admins a one-stop location for handling these requests. 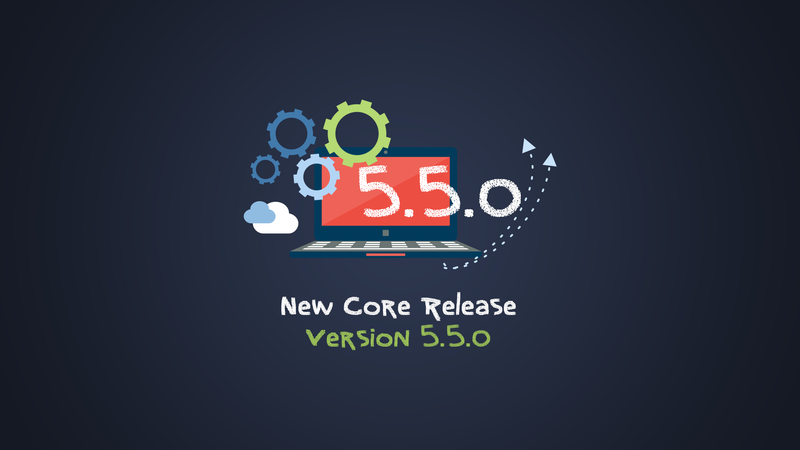 Awesome Support 5.2.0 fully integrates with these items. 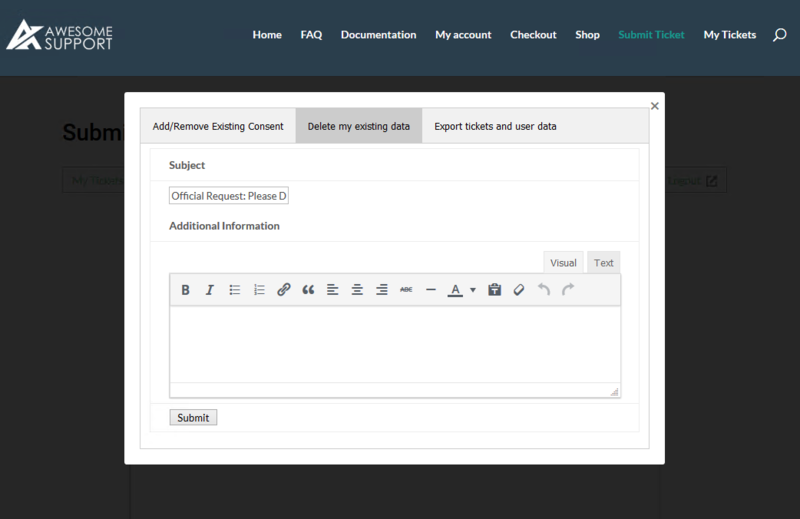 Exporting data from the WordPress TOOLS->EXPORT PERSONAL DATA item will include data from Awesome Support. Awesome Support will attempt to remove ticket data when the TOOLS->ERASE PERSONAL DATA items is used. One of the principles of GDPR and related privacy regulations is that sensitive data must only be retained for as long as needed. Unfortunately, users have a habit of putting sensitive data into support tickets - things like user ids, passwords, credit card information etc. Your admins need a way to edit this information to remove it from tickets just before the ticket is closed. We have provided an option to allow you to control who can edit replies on tickets. Additionally, we have provided an option to allow you to determine whether you want to save the original data before it was edited so you have a history log of edits being done. In a situation where you have to delete information, you are going to be stuck between a rock and a hard place in certain industries. This is because you might have audit trail requirements for edits under certain regulations while also having to remove information without keeping it around under GDPR and other similar privacy regulations. At some point you'll have to choose one or the other - so we give you the option to do either. 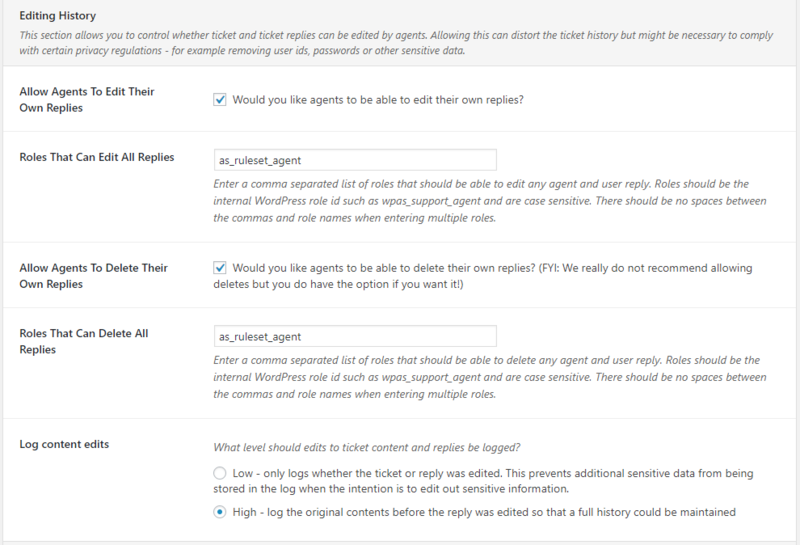 The admin can now configure security options that allow the user or agent to delete attachments. 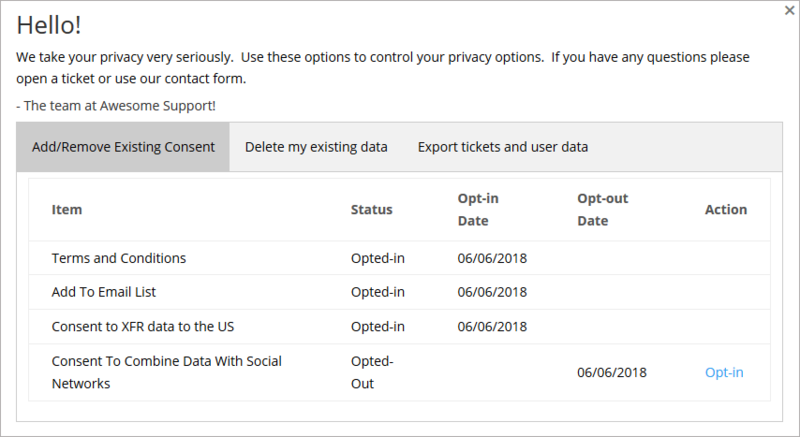 You can now automatically delete attachments when tickets are closed (see image above for screenshot of relevant options). This is useful if you're constantly handling sensitive documents or just want to conserve local disk-space. Some servers have configurations that make handling attachments problematic. Prior versions gave you one option for working around these. In this version we give you a second option - force all attachments to directly download instead of attempting to render in the browser. This new option is located in the TICKETS->SETTINGS->ADVANCED tab. We added new settings tabs for FIELDS and PERMISSIONS. This reduces the length of the GENERAL settings tab page. If you have a requirement where you do not want customers to close their own tickets, you can now choose this option under TICKETS->SETTINGS->GENERAL. In the past you could achieve the same effect with roles and the close_ticket capability. This new option makes it easier by offering a single check-box option that automatically affects all your customers. The option to use WordPress Roles and Capabilities still remain to handle the cases where you only need to prevent a subset of users from closing tickets. 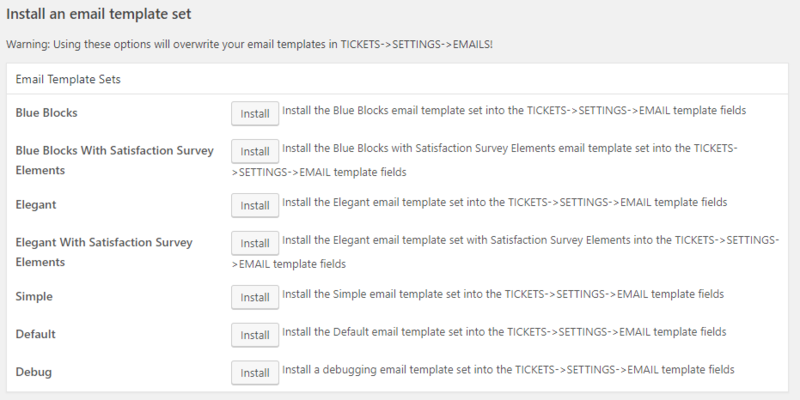 We split out the upgrade tools into its own table in the TICKETS->TOOLS->CLEANUP screen. We updated the tracking opt-in message to include a link back to our site that discloses the information collected when you opt-in. You can now sort and filter on the original ticket id when tickets are imported from SAAS systems. Add an empty BS4 css theme file to the awesome support BS4 theme file folder to prevent a file not found error. Changed a doaction hook to an apply filters hook - the wpas_show_done_tool_message hook is more usable as a filter. Added optional parameter to function wpas_is_agent to pass in an agent id instead of just checking for the current user. You can find more detailed release notes on wordpress.org.